Our strongest cleaner, removes adhesives and problem contaminants from uncoated surfaces. CAUTION contains Methylene Chloride so keep away from all coatings and plastics. 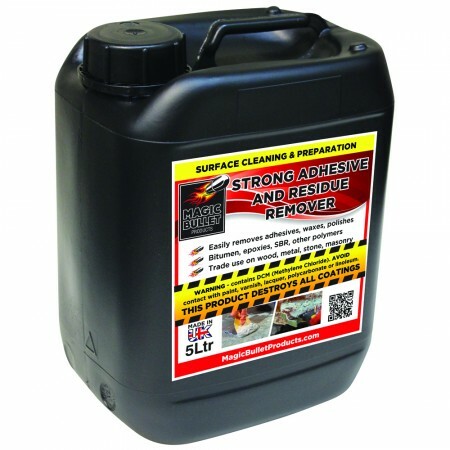 Magic Bullet’s ‘Strong Adhesive & Residue Remover’ (ARC) is a Methylene Chloride based cleaner, which has been specifically formulated using specialist chemicals and agents to assist in the speedy and effective removal of nasty adhesives residues and unwanted contamination. Ideal on (uncoated) Wood, metal, brick, stone, concrete and masonry. For use on walls or floors. Do not allow to come into contact with painted, varnished or lacquered surfaces. Also avoid any plastic, polycarbonate, UPVC, linoleum or similar surfaces. WARNING - ARC WILL DAMAGE OR DESTROY ANY COATING IT COMES INTO CONTACT WITH. If in doubt contact the Technical Department of Magic Bullet Products Ltd prior to use, who will be pleased to give you advice. Important - Please refer to the relevant Product Health and Safety data sheet prior to any use. Always use suitable, gauntlet style gloves, eye/face protection and protective clothing. 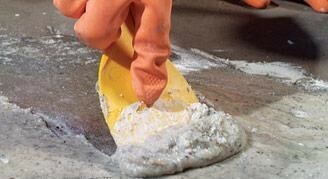 Ensure the surface to be cleaned is dry and protect any adjacent coatings or surfaces from damage. Shake can well before use then apply the product liberally in an even coat using a brush – ARC is gelled for use on vertical surfaces. Do not spread too far, as this will reduce its effectiveness. Allow the product time to work, do not try and remove too quickly. After 15 to 30 minutes agitate a small area to see if the ARC has worked. If not re-apply and wait again. Do not allow to dry out. When adhesive has softened scrape off. Use a stainless steel scourer to remove any difficult residues. Whilst still wet thoroughly rinse off with a weak solution of 5 parts water to I part of Magic Bullet’s Multi Surface Cleaner to neutralize and clean the surface. 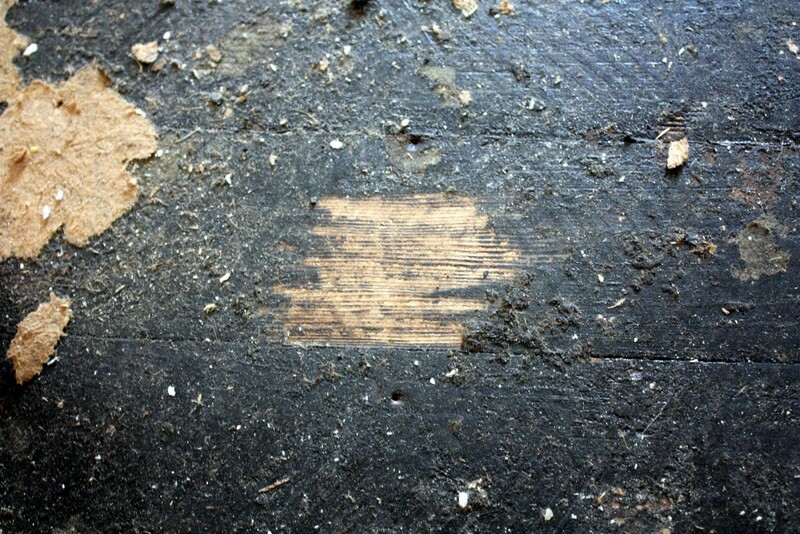 Stubborn contamination may require a second application. Allow removed material to dry and undertake disposal according to local regulations. As with all our products we strongly recommend you carry out a small discrete sample application to test the suitability and surface compatibility of our ‘Strong Adhesive & Residue Remover’ for your particular use.